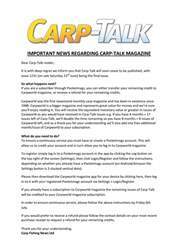 This week’s issue of Carp-Talk (issue 1060) is available to download now. It’s been a remarkable week for the Avenue in Shropshire. The RH Fisheries venue added further credence to its status as one of the best big-fish waters in the UK by producing its fourth different fifty on two separate occasions, as well as the much-coveted 50lb-plus common, Ellie. Full details of all three captures appear in a special report. One of the UK’s leading big-fish venues, the Monument, has undergone some major improvements that will see the fishing improve tenfold. Alex Lister explains all. Steve Kitcher details a recent session where he experienced 90 minutes that he will never forget and Perry Alabaster finally gets his 2015 campaign under way. 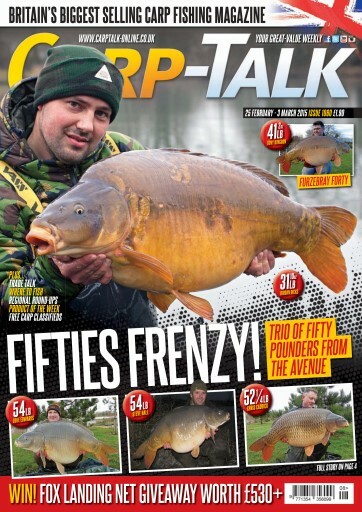 Mark Bryant details his reusable Loop Rig; Rich Seeds lands some lovely carp from Farriers Lake; products from Trakker, Korda, Avid Carp and Fox go under the spotlight in ‘Trade Talk’; and five more venues are recommended in ‘Where to Fish’. 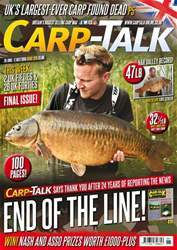 Iain Macmillan’s winter paradise keeps producing the goods and get inside the mind of Adam Garland in this week’s A-Z. 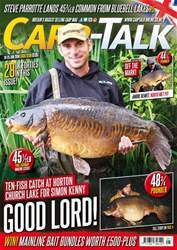 The Fox Mainline Carp Angler of the Year winner is announced, plus loads of other great prizes to give away in: Wychwood Rising Stars, CC Moore Monthly Winners, Gardner Monthly Winner, and also there’s £500-plus worth of Fox Landing Nets to be won.